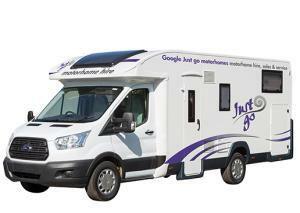 This Just go 4 berth motorhome features a rear double bed making it a really comfortable and versatile motorhome for couples or small families and a real home away from home for your European adventure. This 4 berth is easy and comfortable to drive. It has a generous accommodation for 2 couples as it has a fixed low down double bed at the rear of the vehicle and a second fixed double that electronically lowers from the ceiling. This motorhome comes with 100 watt solar panel, TV and Status aerial, full colour reversing camera and a galley kitchen with oven and fridge.